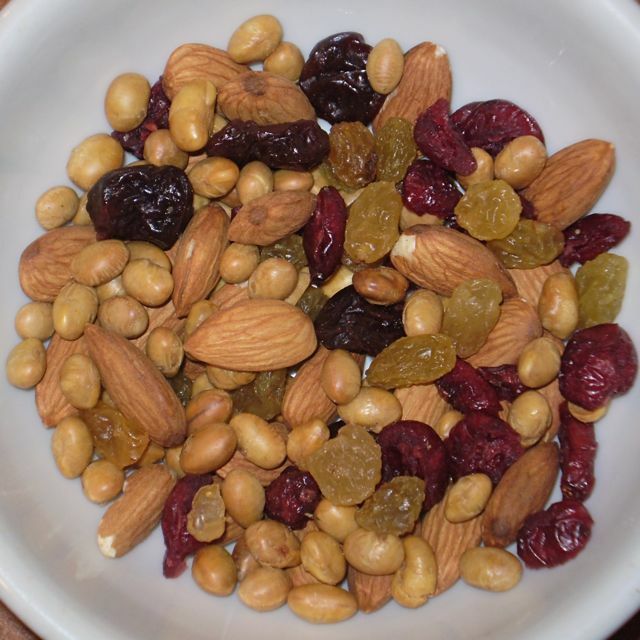 Snack Mix: Healthy and Tasty! This is my new favorite snack food. I accidentally came up with it a few days ago. It’s raw almonds, roasted, salted soybeans, and mixed dried berries. I found raw almonds in the bulk grains and nuts at Homeland at less than $6/lb. It’s the best price in town and they’re always in stock. I checked out the other bulk offerings and came across the roasted, salted soybeans. They’re under $3/lb. so I tried them. First bite is sort of …eh. But one bite leads to another. They seem to want to be combined with something so I added a few almonds to a handful of soybeans. And it never hurts to add some dark chocolate to the mix. Last week I was shopping for dried fruit to add to a batch of granola and found what I wanted at Dollar General. Dried Mixed Berries at $1.50 for 4 oz. Made by Amport Foods, it includes cranberries, golden raisins and cherriesAntioxidants the package reminded me. Sold. I’d already eaten most of the granola and I was out of dark chocolate. I wanted something sweet so I opened the fruit and tossed it into the mix. Good call!